Some retro goodness from 1950: Spike Jones performs in Great Falls! Um…any of you happen to remember that? Lindley Armstrong “Spike” Jones was a popular musician and bandleader specializing in performing satirical arrangements of popular songs. Ballads and classical works receiving the Jones treatment would be punctuated with gunshots, whistles, cowbells, and outlandish vocals. 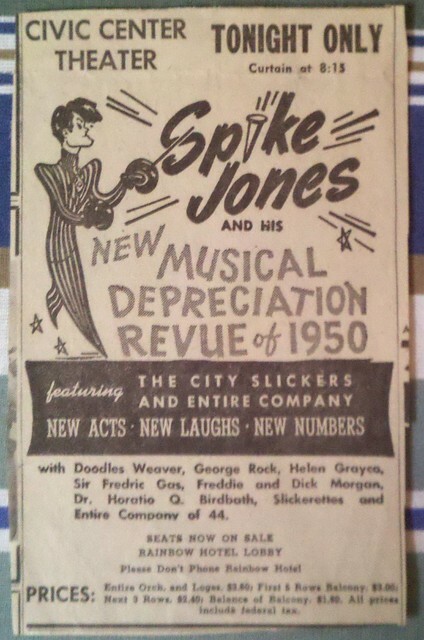 Through the 1940s and early 1950s, the band recorded under the title Spike Jones and his City Slickers and toured the United States and Canada under the title The Musical Depreciation Revue.